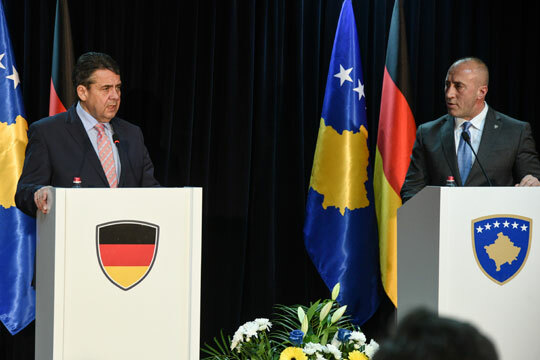 Şimal Çınar –TDO- German Foreign Minister said on Wednesday during a visit to the Kosovan capital of Pristina that Serbia must accept the independence of Kosovo if it wants to join the European Union. "If Serbia wants to move toward the EU, the building of the rule of law is a primary condition," Gabriel said during a joint press conference with Kosovo's Prime Minister Ramush Haradinaj. "But naturally so is the acceptance of Kosovo's independence. That is a central condition to take the path toward." Kosovo declared independence from Serbia 10 years ago. Serbia, however, has refused to recognize Kosovo's sovereignty, viewing it instead as a breakaway province. Serbia hopes to join the EU by 2025, a date set by Brussels and had hoped its stance toward Kosovo would not impede its road towards EU membership. However, Germany, which was one of the first countries to recognize Kosovo along with the United States, France, and the United Kingdom and remains one of the country's biggest investors, remains insistent. Gabriel also said that Germany would continue to push to get Kosovo recognized by the five EU member states that have yet to do — Cyprus, Greece, Romania, Slovakia and Spain. "Such a recognition makes sense because Kosovo will never again be a part of Serbia," he said. "Membership of the European Union is a win-win situation for all." Overall, Kosovo has been recognized by 115 countries, although its United Nations membership continues to be blocked by Serbia's allies on the Security Council, Russia and China.